This is a simple, sweet and sparkly 9mm tennis ball. You can choose your favorite colors. 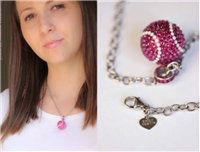 Makes a great gift for any tennis lover! From our racquet collection, this is a new and fun large tennis racquet bracelet with a tennis ball in sterling or gold vermeil. The racquet is 1.5" long and features handset Swarovski crystal in the face and the handle of the racquet in your favorite crystal colors! The racquet is also curved to conform to your wrist. May also be engraved on the back for an additional charge. Please measure your wrist and one and a half inches will be added to the adjustable length.